Do Cherry Seed Pits Need to Freeze Before They Germinate? Cherry trees grow in cold climates where the ground goes through a period of at or near freezing temperatures for several months each winter. A seed dropped to the ground in late fall in a cold climate perishes if it germinates and begins growth before winter sets in. As a cold-climate tree, cherry tree seeds evolved to require a period of chilling to prevent early germination. Cherry seeds require a period below freezing to stimulate germination. Cherry trees do not reproduce true to seed. Commercial growers and home gardeners plant grafted cherry trees. There are two reasons to plant cherry trees from seed; it's a fun project and a good way to get a young child involved with the growing process, and commercial growers use cherry trees planted from seed to provide the rootstock for grafting. Cherry seeds fresh from the market require a period of freezing to break seed dormancy. "Stratification" describes the process used to break seed dormancy. Stratification requirements vary depending on the type of seed and the environment it has adapted to. Some seeds need to be damaged, burned, digested or crushed before they come out of dormancy. Others simply need to spend a few months dormant before germination. Cherry trees require cold stratification to emulate the natural freezing the seed experiences on the ground under winter snow. Harvest ripe cherries from a tree, or purchase ripe cherries at the market. Seeds from fruits that ripen on the tree germinate more reliably than from fruits picked early. When cherries are picked early, the seeds do not always fully develop. Clean off all traces of fruit and fruit pulp, and rinse the seeds in a colander. Spread a 1- to 2-inch-thick layer of slightly damp peat moss or damp sand over the bottom of a bucket, or lay a 1-gallon-size zip-top bag on its side and spread a 1-inch layer of damp peat moss over the bottom. Place clean cherry seeds onto the medium, about 1 inch apart. Cover the seeds with a second layer of the damp stratification medium. When using a bucket or container, stratify multiple layers of cherry seeds separated by 1 inch of damp medium. Place the bucket, container or zip-top bag into a cold-storage area. The refrigerator works well for small containers and zip-top bags. 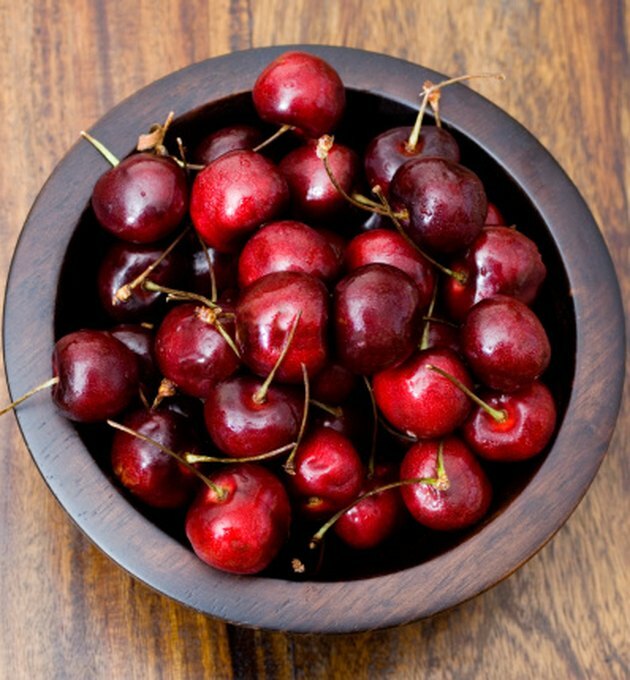 Keep the cherry seeds between 33 and 41 degrees F. The seeds require 98 to 105 days of cold storage to break dormancy, according to Iowa State University Extension. Check the stratification medium to make sure it remains damp. The medium should stay damp in a closed container, but if it does start to dry out, mist with water to dampen the environment around the seeds.